In preparation for writing the Modulation chapter for the 2010 ARRL Handbook, I realized I wasn't up-to-date on the plethora of new modulation formats that have flooded Amateur Radio in recent years. I spent quite a lot of time over a several-week period researching what is out there, entering the information into a spreadsheet as I came across it. I also made a copy in Adobe PDF format. Most of the formats are digital, although I did include ATV, SSTV and FAX. I was most interested in the technical details of the modulation, but I also included information on error handling, typical applications, and the original developer. To give a rough indication of relative popularity, I did a Google search on each format and recorded the number of hits in the spreadsheet. Much of this information came from the ARRL's Technical Descriptions web page. This is the place where developers of digital modes can satisfy the FCC requirement in § 97.309(a) that they must publicly document the technical characteristics. 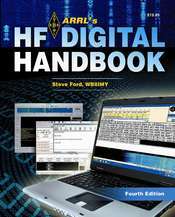 Another good source is the ARRL's HF Digital Handbook (pictured above) and VHF Digital Handbook. A great place to see and hear the various digital modes is W1HJK's Sight and Sound web page. Many digital modes use a PC's sound card as a modem, using appropriate software. Winlink 2000, is the worldwide system for sending email by Amateur Radio. Here's K1JT's site for his famous open-source weak signal communications software suite, including WSJT, JT6M, JT65 and WSPR. There's a small but enthusiastic community of Radio Amateurs interested in HF FAX. A list of 9600-baud packet TNCs suitable for satellite work is on AMSAT's web site. To choose a TNC suitable for APRS, here are K4HG's recommendations. Or you can just use your PC's sound card as a packet TNC. Please email any corrections to .